Nested in the most exclusive residential area of Casablanca, this fully air conditioned villa has 2 levels covering 240 square meters and an elegant and colorful garden on 150 square meters. On the ground floor, there are 2 halls (17 square meters), Water Closet (4 square meters), kitchen(11 square meters), living area (26 square meters) and a dining area (19 square meters). On the 1st floor (full parquet), there is a hall (10 square meters), 1 bedroom (17 square meters) with en-suite full bathroom, 2 bedrooms (44 square meters)serviced by one full bathroom. The villa is within minutes to the Royal Golf of Casablanca, 10-15 minutes to the animated corniche and the commercial center Maarif. Quietness, elegant comfort and safety in the heart of Casablanca. To fully enjoy your stay in Casablanca,a car with a highly experienced driver can be made available to drive you to the Golf, the beach,the restaurants,the shopping centers...Similar arrangements can be made to drive you to Fez(3 hrs),Marrakech(2 and half hours),El Jadida(1 hour).This is subject to proper notice. My husband and I, along with our 2 kids, ages 2 1/2 and 5 1/2, and nanny stayed in this house for about 2.5 weeks. 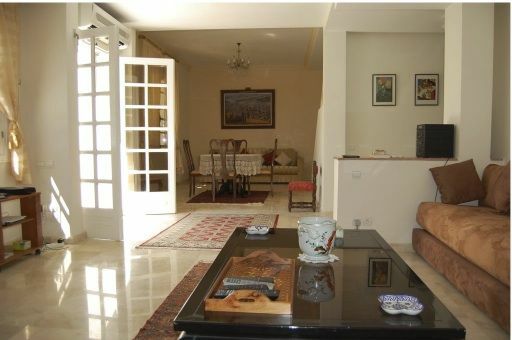 We were relocating to Casablanca and used this property rather than a hotel, as we awaited our permanent residence. The villa is much warmer/cozier than it appears in the photos, and the back yard garden is truly delightful. There is even a spacious terrace off the master bedroom which overlooks the back yard. The owners, who live directly next door, could not possibly be more gracious. They were an invaluable resource about all things Moroccan. Months later, I am still using their tips and suggestions, and we are still in contact. Both of the owners speak fluent French and English, and quite possibly other languages as well. They are available to you as you need them, and disappear when you don't. For the first week of our stay, we utilized the car and driver that the owners can make available. Hadj, the driver was a wonderful "tour guide", taking us everywhere from the grand mosque to the local Home Depot (Mr. Bricolage) and everywhere in between. When I asked to visit a farm where I could buy fresh dairy, he even was able to find a reasonable approximation of what I was looking for. Hadj speaks French -- certainly more fluently than do I!! -- and a smattering of English, although I think he understands it quite a bit more than he speaks it. Even now, when I need a little assistance navigating the ins and outs of Casa, Hadj is at the ready! The house is located in a lovely neighborhood, and it is walking distance from a traditional market, coffee shops, grocery stores, boulangeries, banks and salons. Staying here definitely helped us ease into Casablancan life. Admittedly, there probably isn't one week's worth of stuff to keep a tourist occupied in Casablanca, but if you should find yourself in need of accommodations for at least one week, then you should seriously consider this home over a hotel. It was our pleasure to welcome Ana and her family. We would love to have guests as openminded and well educated as them. Our sincere thanks to her for taking the time to comment about her stay in our property. My family stayed in this property during summer 2010 and it was perfect for our family. We were a group of 5 persons ( my husband, my 2 years old twins, our nanny and me). The house in real looks perfect, clean and very comfortable. The owners were amazing as they live next door and were helpful in every way possible. They were welcoming and generous and they make us feel like family. The wife of the owner is a real lady and was elegant in dealing with the entire family. The owner was as well helpful abd a gentelman. He is very knowledgable man and we had fun talking to him. I am so happy that I found the post of their property to thank them as I lost all their contact details when I returned from Morocco. My family and I want to thank them from the bottom of our heart and when we revisit, we'll definitely stay in this property. Love. Safaa and Peter Arthold (the twins sends you a big hug).